I then twist the reservoir into the end of the infusion set. I rewind the insulin pump so that it knows there is zero insulin inside and can essentially start to recount my usage (I tell it I use 100 units per new supply). 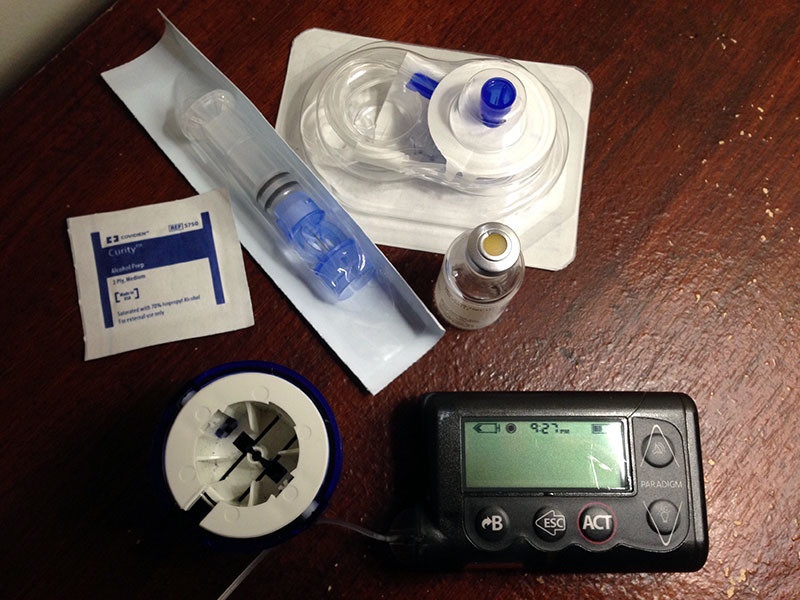 I place the new reservoir into the insulin pump and then fill the 23-inch thin plastic tubing of the infusion set so that I know insulin will safely travel through the cannula from the pump to underneath my skin (this usually requires 6-9 units of insulin per fill). Once the insulin drips from the other end of the tube (and after my cat sniffs it), I secure the infusion set into the blue cylinder doohickey, remove the tape and needle cap, and place against the spot on my skin I rubbed with alcohol earlier. I usually tense at this moment even though I’ve done it a million times. For the most part, it doesn’t hurt when the needle shoots the infusion set beneath my skin, but sometimes it may hit muscle or some tender spot and hurts like hell (but only for a second). When I find my courage, I press the two buttons on the side of the cylinder doohickey and attach my new infusion set to my body. I then tell the insulin pump through a series of commands that I was successful and decide whether or not to fill the cannula again (usually I fill it with 0.2-0.5 units of insulin upon initial attachment). But then there are times when testing the new infusion set, insulin cannot be delivered. I may have to replace the reservoir or the infusion set itself. Either way, it’s a pain to have to waste supplies (that only cost me $90 for a three-month supply but without insurance could easily cost me $300 for a month supply). I never take this for granted and may be why I try to extend my diabetes supplies to their utmost capacity. I should also report these incidents to the manufacturer but invariably never do. The last time I changed out my insulin pump reservoir, I got a surprise. Before starting the whole process I mentioned above (and sometimes after), I pull out the last infusion set from underneath my skin. This time, blood started gushing from the injection point, and I immediately grabbed a paper towel nearby and pressed down. A few minutes later the paper towel was soaked, and the wound was still spewing blood. Okay that may be a bit overdramatic, but suffice it to say, blood was continuously coming out of the injection site. I guess I’ll stay away from that area around my belly button for a while, I thought. Once I got it to clot, I cleaned it with alcohol and put a bandage over it. It had only been three days since I last changed my insulin pump reservoir but considering how many times I’m injecting something underneath my skin, it’s amazing I don’t have more scars. I’ve only been diabetic for six years, but already the tips of my fingers on my left hand are black and tough so that sometimes it’s hard to prick them anymore for enough blood to place on my test strip for the glucometer to read. And then there’s my continuous glucose monitoring (CGM) system. Every seven days, I’m supposed to poke another part of my body (usually the tops of my buttocks since I use my stomach for my insulin pump) and keep that wireless transmitter attached to me at all times (unlike the insulin pump, it is waterproof). This thin rectangular gray device transmits my blood sugar readings back to my CGM receiver, which then tells me an estimated range and whether that level is trending up, down, or stable. But it usually takes a few days for the CGM to catch up with my actual readings so I find it’s most accurate (not unlike other diabetics) between days 7-14. And these CGM sensors are even more expensive than my insulin pump supplies (I currently pay $70 for a month supply – I cannot get a 90-day supply because my insurance’s mail-order pharmacy doesn’t carry them). So I usually change these sensors out every two weeks (sometimes three if I’m lucky). Again, this is probably not good for my skin, but I monitor my injection points closely and do the best that I can. Sometimes I wonder what my body will look like in 10 years. But the important point is that I will have a body to look at in 10 years because these devices, no matter how painful or expensive, enable me to live the best life I can live (I do not believe there will ever be a cure in my lifetime although I am hopeful). Right now, I’m just thankful that I have access to them and that I can afford them (it disheartens me when I read stories like that of Medicare, which won’t cover CGMs for older diabetics). So when I remove my last insulin pump reservoir and see the blood, I just chuckle and think you know you’re diabetic when… and I would easily take the pain of poking at my skin every 3-7 days as opposed to multiple injections and finger pricks in a single day. It’s amazing to think that used to be everyday life. But then it’s also amazing to think that I only used to deal with needles when I visited the doctor once in a blue moon. I don’t even remember what that life was like anymore.